Robin Sloan. Farrar, Straus and Giroux; 2012. 304 Pages. Hardcover. This book was truly a lively and delightful read. It wasn’t filled with an overly dramatic or heavy subject matter, but was simply a wonderfully entertaining book. I would actually say this book was the definition of entertaining. This story follows the journey of a young man named Clay Jannon who finds a job at a quaint and quirky bookstore. While working the nightshift at this bookstore, Clay encounters a variety of unique and eccentric customers. The strange thing about these customers, however, is that they never buy any books; instead, they merely ‘check out’ the oldest books in the store. Clay soon discovers that there is much more to this bookstore and some of the books inside it than he thought. We, the readers, then follow Clay on his journey to decode the mysterious books and everything that goes along with them. First, I love books (obviously). Because of this, I loved that this was one of those "books about books" and that the overall focus and aspect of the novel was... well, books. The bookstore itself was so entertaining to read about, with its huge, towering bookshelves and different varieties of books it contained (i.e. "regular books," the "Waybacklist"). When I first started this book, however, I don’t think I realized how much of a role modern technology would play in it. I feel that most authors who try to incorporate advanced ideas and technologies are either really successful at it, or fail miserably. Luckily, I found Sloan to be extremely successful in this endeavor. I found the topic itself to be very interesting, and I found myself intrigued by the programming and coding that was used throughout, no matter how accurate or inaccurate it may be. I think all of it added a really nice touch to the story. There was also a very unique array of characters that each had an extremely distinct and entertaining personality; they brought such life and excitement to the novel. One of my favorite aspects of the novel was Clay himself. He had such a witty and refreshing narrative that truly captures you and transports you into the story. The pacing of the novel was spot-on; I never felt that the story was too rushed. I also did not find myself getting bored from the novel moving too slowly either. And yes, this book does seem a bit far-fetched at times, but it is fiction, afterall, and that is extremely understandable. Overall, I found this to be an extremely well-written and exciting novel that I would definitely recommend to anyone. 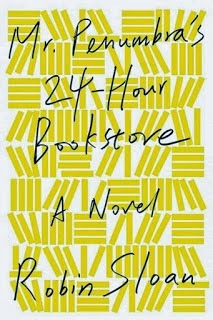 Mr Penumbra's 24-Hour Bookstore will receive a nice four stars from me.